Open plan living areas maximize use of space and flow throughout your home. It gives your home a modern and calm atmosphere, but you still want a certain degree of separation to distinguish between the different functional spaces within the open area. To achieve this, you need something that would not disturb the harmony in your open space area. The perfect solution is Facet, our living room and dining room divider screen. Facet is a thin, slightly transparent room divider with a striking pattern. It works beautifully as a living room and dining room divider. It lets light through and you can partly see through it, which means you do not lose the open character of the space. While dining in the dining room you will feel cozy and have enough privacy from the rest of the open area without being completely cut off. Personalize your living room and dining room divider. The entire divider screen is made up of elegant diamond shaped parts. The separate parts can be rotated around for a full 360 degrees. This gives you the freedom do decide for yourself how much you would like to be seen through your separation screen. If you look at the different pictures featured here, you can see how the pattern and amount of transparency changes when some of the diamond shaped parts are slightly tilted. You can see how the geometric pattern changes shape and how you can see more through the screen when some parts are tilted versus when they are not. Not only is our divider Facet the ultimate space dividing panel because of its practicality and beauty, it is also very easy to attach. 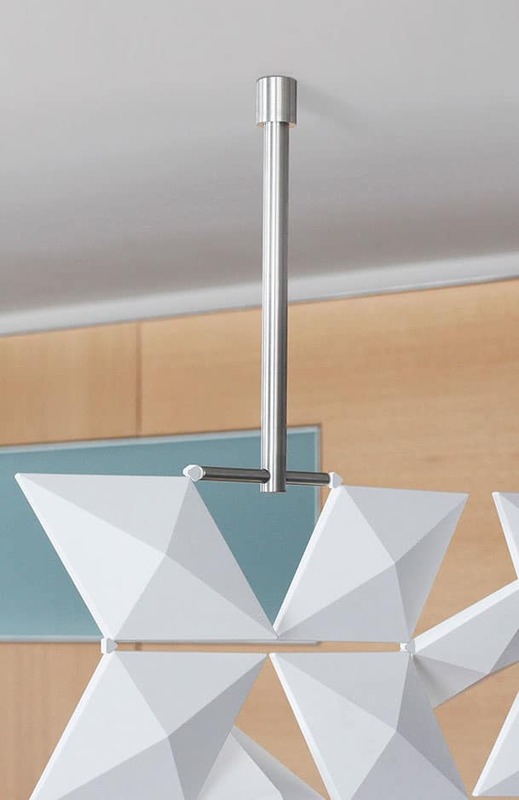 It is lightweight and only needs one screw per ceiling attachment. If you follow our user manual, you will have your very own living room and dining room divider hanging in a few easy steps. We also are available to call or via email if you have any questions. The project in the pictures is installed in a stylish loft in Eindhoven, The Netherlands. It divides the kitchen and dining room area, from the living room. The interior designers chose a bright white for the color of the screen and a brushed stainless steel finish for the ceiling attachments to match the modern vibe of the place. The living room and dining room divider Facet is available in a range of colors and we can make it in any size to make sure it fits your specific taste and interior decoration.